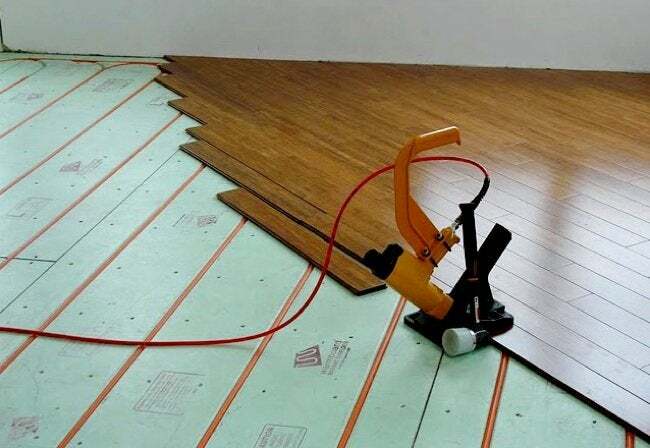 Radiant floors provide a host of advantages, the sum of which is attracting more and more homeowners to this convenient, comfortable, and energy-efficient heating option. It’s 7 o’clock on a winter morning. Your alarm clock goes off. You muster the strength to rise up out of the warmth of your down comforter, swing your legs over the edge of the bed, and all of a sudden, BAM: your feet land on top of an ice-cold floor. Many homeowners consider this type of experience inevitable, but it’s not. Another common issue you don’t have to accept is the way in which cold flooring undermines the overall temperature control of your home. In both cases, the solution is this: radiant floor heating. Radiant heating systems are increasingly popular installations based on a network of pipes or wires set beneath floor level. While radiant heat creates a comfortable surface to walk upon, it also transforms heat-stealing floors into surfaces that actually supplement the warmth you strive to foster in your home. The heat produced by radiant floors comes from one of three sources: hot air, electricity, or hot water. Of the three, hot air ranks as the least energy efficient. In fact, though at one time it was frequently linked with solar power systems, hot air-based radiant heat is rarely used today. The high (and rising) rates charged by utilities render electric systems rather pricey to operate. One strategy for minimizing running costs is to situate the system under a thick material like concrete. If you heat the floor during the electric provider’s off-peak hours, it can release that warmth slowly over the course of a day. Water-fed, or hydronic, radiant floor heating systems are the most efficient. How do they work? Water heated in a boiler is pumped along lengths of flexible tubing. Though it can be handled in different ways, that tubing is typically fitted into the channels of specially designed subfloor panels. Radiant floor heating boasts a higher level of energy efficiency than most traditional setups. Picture a forced-air system: Since heat rises, placement of air vents on the ceiling results in a significant waste of resources. Radiant floors, in contrast, put the heat right where you live—not several feet above your head. Additionally, electric or water-fed radiant floors are not subject to the heat loss suffered in HVAC designs that depend on ductwork to funnel heated air between rooms. You’re probably familiar with the clanks, pops, clicks and creaks that characterize electric or water-powered baseboard heat. Forced-air heat is equally noisy; sometimes it can sound like a salon full of hair dryers when it kicks on. By comparison, radiant floors are virtually silent. The “everywhere” warmth generated by radiant floors provides a qualitatively different experience than what you get with systems that turn and off, intermittently blasting out heat. For the homeowner, the even heat of radiant floor system means less wrangling with bedcovers at midnight and fewer instances of fussing with the thermostat during the day. Radiant floors can help you save money on your monthly heating bills. Particularly efficient are those radiant systems that feature better-than-average conductivity. 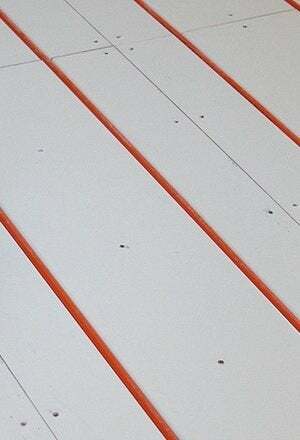 For example, Warmboard transfers heat so effectively from the hot water in its tubing to the air in your home that it requires less energy to operate than other products. Many hydronic radiant systems require water to be heated to a temperature of 140 degrees or higher, but Warmboard does as well or better with water heated only to 104. One common complaint about forced-air heating is that dust mites often live in the ductwork, upsetting those with allergies. (To a lesser extent, hard-to-clean baseboard heat gives rise to the same problem). Another complaint is that forced-air systems—and their hot, dry air—negatively affect asthmatic homeowners. Radiant floors? They release no harmful allergens and are as easy to clean as your flooring.